Blue Dog Democrats—What Do You Expect With Only Two Major Parties In A Nation Of 300 Million People? Many of my fellow liberals are upset about the so-called Blue Dog Democrats who are putting the breaks on aspects of President Obama’s health care proposals. While I also wish that everyone was as liberal as I am, I’m not sure what people expected after last November’s elections. If you try to win a majority in the U.S. House of Representatives when there are only two major political parties for over 300 million people, and if you contest and win House seats in Republican leaning districts—What do you imagine you’ll get? A Democratic majority of all liberals? I think some of these blue dogs could be a bit more brave. I also think President Obama could do a better job selling his ideas to the public. I wish the public as a whole got things right more often instead of allowing themselves to be scared by false notions of government running their lives. Yet in the end I have to wonder what people figured would be the result when Democrats won House and Senate seats— in both 2006 and 2008—that had previously been held by Republicans. There are only two major political parties in our nation of over 300 million people. Any legislative majority in the House or Senate is likely to consist of a variety of viewpoints. This is especially so for Democrats who have a far more diverse voter base than do Republicans. Democrats can win as many legislative seats as possible and have a more divided caucus, or they can lose some of the more moderate members and have smaller majorities or no majority at all. Brilliant University of Connecticut scholar & author Dr. Janet Watson has taken the picture you see above while conducting research in Reading, England. Janet and I are friends and she told me I could rip this photo off her Facebook page. Janet is a professor of history. However, when she sees many swans in one place she takes a picture. Janet is the author of Fighting Different Wars—Experience, Memory, and the First World War in Britain. Here is a link to buy this book. I have bought a copy of Janet’s book. I’m looking at it right now. I’ve not read it as of yet, but I will. It can take me a few years to get to a book once I buy it. I have a lot of books. Janet is in England doing research on her next book. I think the new book is going to be about a mermaid who commands a community of talking dolphins….No, hold on…That’s the book I hope to write some day. Janet says that the one bird on the left of the picture—the one with the white patch under the neck—is an Eurasian Coot. How does she know this? I don’t know. Maybe she asked the bird. Here is information about the Eurasian Coot. Here is the web home for Reading. The folks over there would like you come and visit. My guess is that the swans in the picture are Mute Swans. Here are facts about Mute Swans. Above you see the Ed Gonzalez for Houston City Council sign located at 1218 Shepherd Drive in Houston. Mr. Gonzalez is the District H member of Houston City Council. He is running this November to keep his seat on council. I’ll assume that Councilman Gonzalez and the Gonzalez campaign got permission from the property owner to attach that sign to that fence. I’m certain the campaign did not just come around and stick a sign up on vacant property. Though I do suppose reporting the property would be a knife-in-the-back of the property owner. Maybe the Gonzalez campaign could pay back the owner for his or her loyal support by offering to clean the area behind the fence. Maybe Gonzalez campaign volunteers could walk this stretch of Shepherd and make it nicer for all the people of Houston. For the moment however, what you see is the Gonzalez for Council campaign as it is represented at 1218 Shepherd Drive. Above you see the Karen Derr for Houston City Council sign located at 1218 Shepherd Drive in Houston. Ms. Derr is running for Council At-Large position #1. As you can see on the sign, her campaign web home is KarenForCouncil.org. We’ll assume that Ms. Derr and the Derr campaign got permission from the property owner to attach that sign to that fence. I’m certain the campaign did not just come around and stick a sign up on vacant property. So even though–of course–the sign has been placed there legally, I do wonder why Ms. Derr or the Derr campaign does not report this property to the city for possible citation. This location is a public eyesore! Though I do suppose reporting the property would be a knife-in-the-back of the property owner. Maybe the Derr campaign could pay back the owner for his or her loyal support by offering to clean the area behind the fence. Maybe Derr campaign volunteers could walk this stretch of Shepherd and make it nicer for all the people of Houston. For the moment however, what you see is the Derr for Council campaign as it is represented at 1218 Shepherd Drive. Above is a video of me using a specific verbal style in an effort to convey deeper meaning. The video is 39 seconds long. Please give it a play. Relevant to this post is a post I made in April of 2008 about Sojourner Truth. 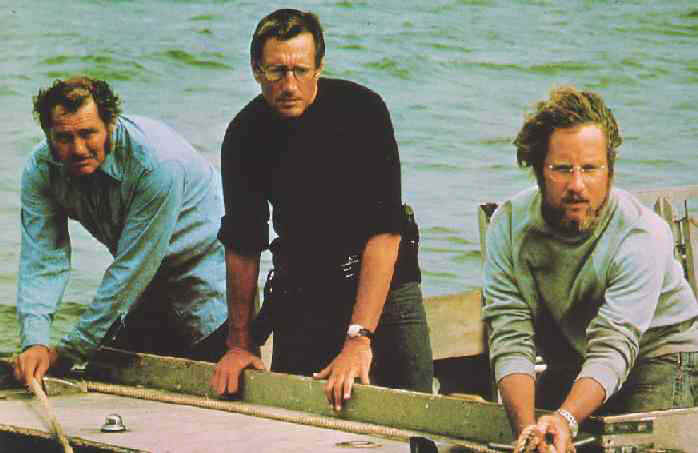 Here are the reasons I watch the movie Jaws each summer. 1. I think it would be nice to spend a summer in Long Island at some beach town. 2. I like looking at the ocean. 3. I like movies that involve sea creatures because I like sea creatures. Here is a recent press release from the National Oceanic and Atmospheric Administration about a program to restore the population of Blacknose Sharks. NOAA has great press releases about all sorts of ocean-related topics. 4. Because I’d rather see the movie many times than read the book again. I read Jaws by Peter Benchley a few years back. I figured that I would for once in my life read some mass-market beach-read type of book. The book was awful. It was silly. There was some sort of plot line involving the mob or something like that. The book was not nearly as good as most of the novels I normally read. Call me a snob—I don’t care. I’ll call you back something in reply. Here is an obituary of Peter Benchley. Sure he was a global best-selling author—But did he ever have a blog? 5. I like the part where the local Chamber of Commerce tells the police chief to keep the beaches open despite the shark attacks. The private sector is always making up some sort of story. This blog is now three years old. I began regular posting on Texas Liberal on July 25, 2006. I have spent a lot of time working on this blog. I feel it has for the most part been worth the time. I hope I feel that way whenever I decide I am done with the blog. It adds value to life to have a forum with which to communicate. As I wrote this post, Texas Liberal has received 721,842 page views. I’ve made 1452 posts through yesterday and there have been 4557 comments posted to the blog. In 2006 I averaged 51 page views a day. In 2007 that number was 177. For 2008 I ran 912 views each day. So far this year I’m at 1513 page views per day. So, at least in regard to blog traffic, I’m headed in the right direction. I’m also a featured political reader-blogger at the Houston Chronicle. My space at the Chronicle is second from the bottom of the politcal bloggers listed. Thank you to those who have read the blog over the past three years and thank you to those who have left comments. If you like Texas Liberal, please pass on the link to somebody you love— Or anybody at all. A blog grows one reader at a time. I can also be found on Facebook. My name is Neil Aquino. My current profile picture is of me in a suit standing next to very well-dressed woman and with three drunk men waving behind me. Please feel free to make a friend request. It is good to communicate with others. Please give consideration to who you wish to communicate with in life. Please consider what would be the best way to proceed with that communication. You’ll be glad you made the effort to reach out to other folks. Please also know that I’ll be the host of the biggest punk rock concert of 2009. It’s taking place on August 15 at Newport, Kentucky’s Southgate House. Newport is just across the Ohio River from Cincinnati. Death Rates Increasing For Hispanic Workers In U.S.
USA Today reports that deaths of Hispanic workers in the United Sates are up 76% since 1992. This despite the reduction in the number of all workplace deaths in the United States since 1992. “Hispanic workers have fallen off roofs, been crushed under heavy machinery and run over by trucks, according to workers’ rights advocates, such as the Austin-based Workers Defense Project. Austin alone has reported four Hispanic deaths this year. Last month, OSHA pledged to bolster the number of inspectors in Texas in response to the growing number of construction-related deaths, more than half of them Hispanic…. Workers without legal documentation to be in the U.S. are less inclined to join a union, which helps protect workers, or protest when conditions seem dangerous, said Raj Nayak of the California-based National Employment Law Project. “They’re doing the most dangerous work for longer hours,” Nayak said….Jose Omar Puerto, 19, from Honduras, was repairing a roof on an Austin apartment building in 2007 when his aluminum ladder became entangled in electrical wires. He was electrocuted and killed, his sister, Marta Puerto, said. 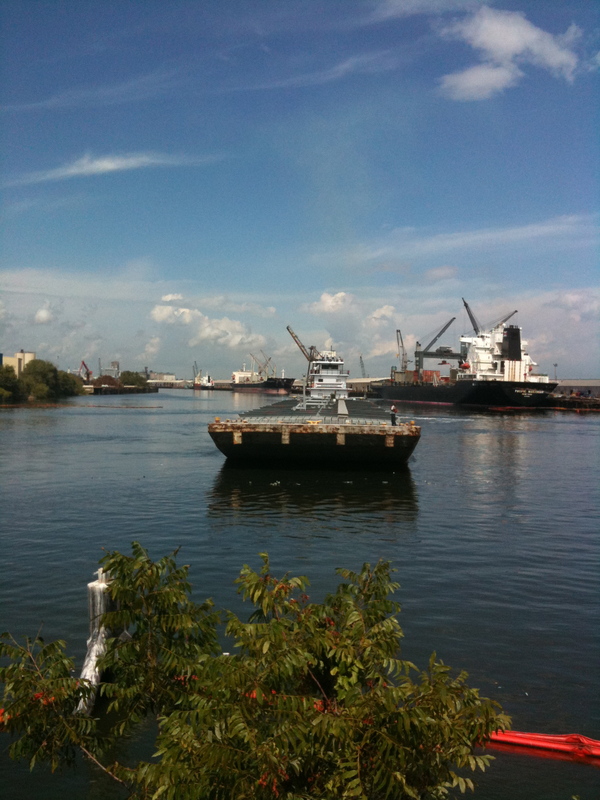 …His company paid for the funeral and the body’s return to Honduras, she said. The family received no further compensation…. Some of the fatalities among Hispanics could have been avoided with proper training, said Michael Cunningham of the Texas State Building and Construction Trades Council, a labor consortium…”No matter what country they’re from, whether they’re here legally or illegally, someone should make sure they have the proper training,” he said. Here is a story about the machine death of 40 year old Ana Marie Vital. Ms. Vital died in California on July 21 when she was sucked into a machine at a factory that is a major supplier for McDonald’s. Some folks in Texas and in all parts of the United States love immigrant-bashing. They go after folks who crossed rattlesnake-infested deserts to be treated poorly by people who often have little self-discipline and little regard for others. We all want the lowest prices at the store, but we rarely ask who is bearing the brunt of lower prices. It is not the fault of immigrant workers that many in Texas and in the United States have long failed to take advantage of the benefits white skin has historically offered in our nation. We need to treat each other with compassion. We need to realize that our fates are all connected. Above is the painting Great Piece of Turf. It was painted in 1503 by Albrecht Durer. 1. The discipline involved in getting it right. 2. The artist’s apparent view that something as common as a chunk of grass and weeds merits consideration. The common things in life often have great value. 3. The presence of soil, grass and light in the painting. There is a whole world in that small piece of the Earth. 4. I enjoy how the precision of the painting allows my imagination to proceed without barrier. The painting is a chunk of the world well-represented, and now I am free to imagine a symbolism or imagine creatures living within the turf. Here is information about Albrecht Durer. Below is the weekly Texas Progressive Alliance round-up. The Texas Progressive Alliance is a confederation of the best political bloggers in Texas. 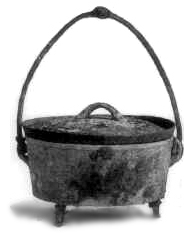 Above is an illustration of a Dutch oven. The Dutch oven is the official State Cooking Implement of the State of Texas. Here is a list of Texas State symbols. Here is the link to the Lone Star Dutch Oven Society. The third paragraph in this Handbook of Texas Online article about Buffalo hunting mentions use of the Dutch oven by the hunters. Here is the link to the International Dutch Oven Society. CouldBeTrue of SouthTexas Chisme is sick of cronies running our cities our state and our country! WCNews at Eye On Williamson on more GOP shenanigans: Republicans, hypocrisy, the stimulus, and more Carter “nuttiness”. Off the Kuff notes that as Texas’ unemployment rate continues to rise, we are now in the position of having to borrow hundreds of millions of dollars from the federal government to fulfill our unemployment insurance obligations. Heckuva job, Governor Perry! John Coby at Bay Area Houston has posted a A How to Guide for Illegal Immigrants to Vote in Texas Elections. Xanthippas takes on more disability-as-diversity nonsense. Also, on a side note, his blog Three Wise Men‘s 5th anniversary is this Tuesday. We’ll be putting up a special post in commemoration. The Texas Cloverleaflooks at how the NTTA will be raising rates because volume is down. So much for supply and demand theory. Above is a video of me in Downtown Houston singing a portion of the Shaker hymn Simple Gifts. The video is 33 seconds long. Simple Gifts was written in 1848. Please click here for a video where I recite all the lyrics to Simple Gifts while on Galveston Island. You’ll also find information about the song at the link. I’ve adopted some words from this song as my new personal motto. I’m going to try to live by these words to the extent I’m able. If I can live by these words, and if I can create things of value with the talents I have in life, then I’ll merit the regard of my friends and the regard of people I meet as I proceed in the world. It is all a work in progress. I follow baseball. I don’t write much about baseball in the blog because I feel there is enough attention paid to sports. I follow baseball as relaxation. I enjoy the statistics and I know some baseball history. I don’t have any favorite team because I don’t want stress from baseball. I don’t care who wins. Please allow me to offer comment on Mark Buehrle’s perfect game of July 23, 2009 A perfect game is when a pitcher allows no runners to reach base for the entire game. 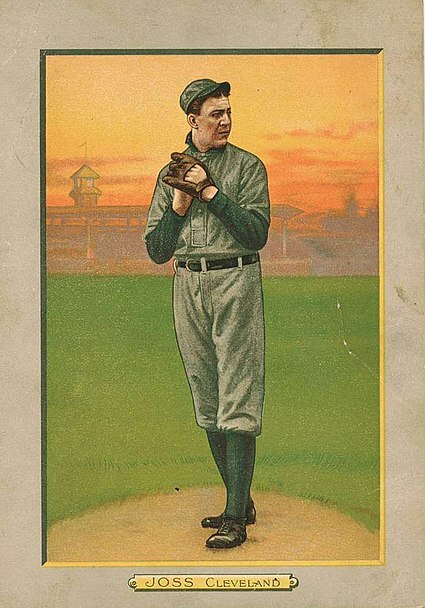 In a no-hitter, runners can reach base on errors and walks and in other ways. A perfect game must be perfect. With Mr. Buehrle’s effort, there have now been just 18 perfect games in 134 seasons of Major League Baseball. Mr. Buehrle pitches for the Chicago White Sox. The victims of the perfect game were the Tampa Bay Rays. Mr. Buehrle is a very good pitcher who has over the years , without much notice, been making a solid career for himself. Please click here to see Mr. Buehrle’s career statistics. I think if Mr. Buehrle can keep up what he has done so far for another 6 or 7 seasons that he might merit consideration for the Hall of Fame. 1. Perfect games, while still rare, are not as rare as they once were. Half of the 18 perfect games have been pitched since 1981. This means the other nine are spread out between 1876 and 1980. From 1922 until 1956 there were none pitched at all. While Mr. Buehrle is not a strike out pitcher and had only six strikeouts in his perfect game, I would offer the theory that the shift in recent years towards offenses geared to home run hitting has created a greater chance of perfect games. There are more strikeouts and more of an all or nothing outcome to at-bats—Strikeouts or home runs with less of everything else. With this the case, the chance is there that a pitcher can put it all together for one outing and blank the opposing team completely. 2. Many of the pitchers on the list were good or very good. If you follow baseball you can look at the list and see for yourself. If you don’t– You’ll just have to take my word for it. Though even if you don’t follow baseball, you might know the names Cy Young, Sandy Koufax and Randy Johnson. You might think that something that has happened only 18 times in 134 years is a fluke when it does happen. Instead, it seems that being good to start with is of assistance when it comes to pitching a perfect game. Mark Buehrle, Chicago (AL) vs. Tampa Bay, 5-0, July 23, 2009. Randy Johnson, Arizona at Atlanta (NL), 2-0, May 18, 2004. David Cone, New York (AL) vs. Montreal, 6-0, July 18, 1999. Above is a Musk Ox. Just looking at that thing puts me in a good mood. What is that Musk Ox considering? I think it is making up its mind about whether it will gore you or take a nap instead. On one hand it likely hates people, but on the other hand it is sleepy. Here is a link to the Musk Ox Farm in Alaska. The farm is a non-profit that helps native people in Alaska gain from the domestication of the Musk Ox. At the Musk Ox Farm, the wool of the Musk Ox is harvested once each year. This wool is called Qiviut. Here is the link for products you can buy that are made out of this Qiviut. The Alaska Native Heritage Center in Anchorage is a place where you can learn about Alaska’s native populations. Here is the Alaska Native Knowledge Network from the University of Alaska Fairbanks. If you are willing to poke around for a few minutes, there is a lot of information at this site. Not surprisingly, people hunt the Musk Ox. They are easy to kill because when threatenedthey form a defensive circle that is condusive to simply shooting them down. What great sport that must be. The musk ox, Ovibos moschatus, is an ancient species of arctic mammal currently found in remote areas of the far north, including Greenland, Alaska, Canada and Siberia. During the Pleistocene, musk oxen wandered across the Bering Land Bridge to populate North America with the likes of the wooly mammoth, saber-toothed cat, and giant ground sloth. Fossil records indicate the musk ox ranged as far south as France and Ohio during the last Ice Age. The largest wild populations of musk oxen can be found in Canada, especially on Banks and Victoria Islands, Northwest Territory. Musk oxen died off within Alaska by the late 1800’s and were reintroduced from wild herds in eatern Greenland in the 1930’s. Once in danger of disappearing completely, musk ox populations have made a dramatic comeback with a current worldwide population of about 150,000 animals. 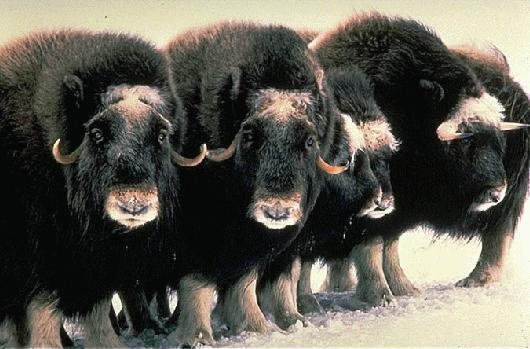 Despite their common name, musk oxen have no musk glands and are not oxen. 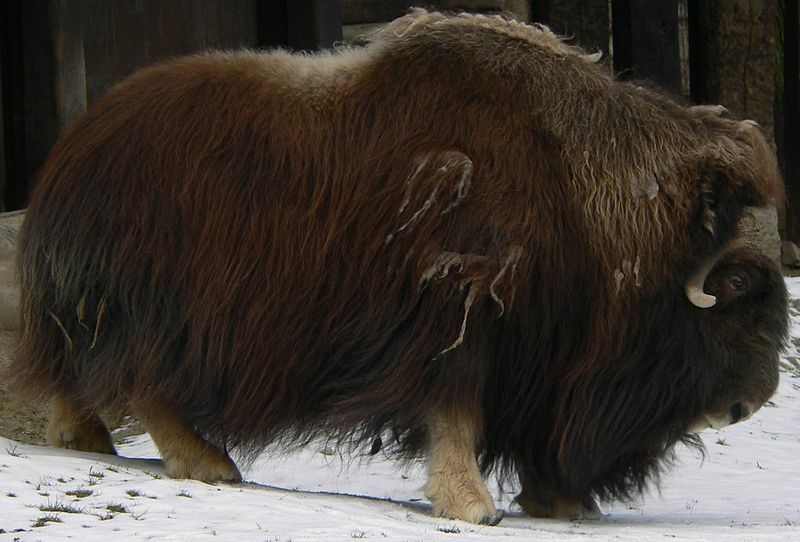 Although they may resemble bison, musk ox are more closely related to goats and sheep. This arctic ungulate, like domestic cattle, has a four-chambered stomach and eats a wide variety of foods such as lichens, grasses, and leaves. Here are some more facts about the Musk Ox. Below is a picture of a bunch of Musk Ox. Maybe they are having a meeting of some kind. Above is a video of me reading a brief passage from Federalist Paper #9 at the San Jacinto Battlefield State Historic site. This reading is in response to recent disloyal comments by Republican Texas Governor Rick Perrry suggesting that Texas might wish to consider leaving the union. The video runs 1 minute and 40 seconds. The San Jacinto Battlefield Site is where Texas won independence from Mexico in 1836. Here is information about what Governor Perry said about Texas possibly leaving the union. Here is the link for visiting the San Jacinto Battlefield Historic site in LaPorte, Texas. LaPorte is just outside of Houston. Here are facts about the Battle of San Jacinto from the excellent Handbook of Texas Online. As you heard in the video, I was at the battlefield on a windy day. Here is an explanation of wind. In the video you can see the wind move the clouds that are in the background. Here is an explanation of why clouds are white along with other facts about clouds. I don’t have time for a post of any length today, but I do have time to offer you this gift of a picture of technicolor flowers. Blog reading public—Though I don’t have much time today, I still care. I’ll be back with you very soon!